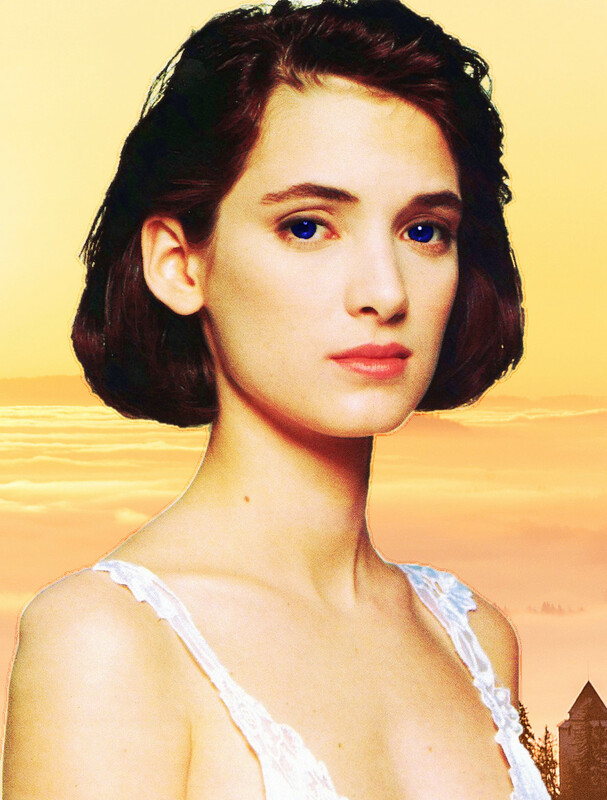 Hey, all. 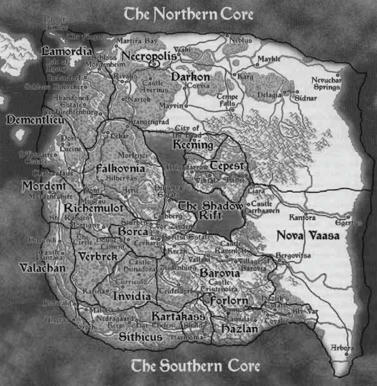 Just thought I'd post some maps of the Core, both pre-Great Upheaval and post-Great Upheaval. These were made by David "Jester" Gibson of the Fraternity of Shadows (www.fraternityofshadows.com) and are used with his permission. 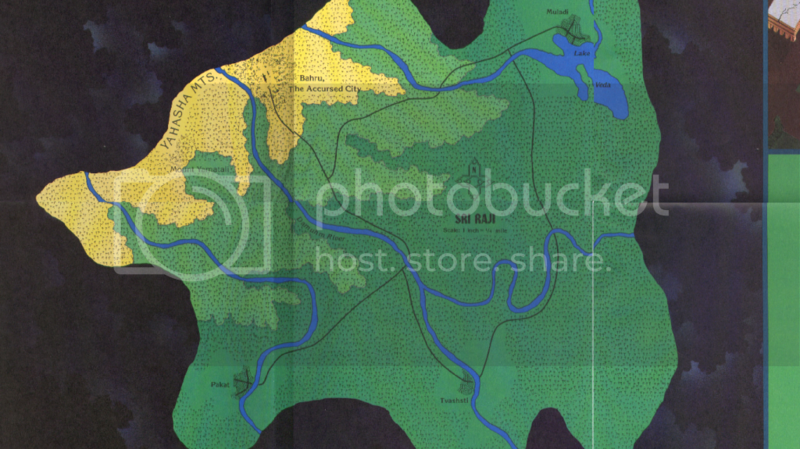 Have you seen the newer maps of the core since Ravenloft was bought/sold to WW? It wasn't sold to White Wolf, they were given permission to produce the Ravenloft books under license from 2001-2005. WotC retained ownership the entire time. Out of humble curiosity, where are the islands of Terror? Where is the doom and gloom Lovecraftian land of Cthulhu, Bleutspur, in regards to all these places? Or Kalidnay, the "we figured we'd throw Darksun in here too" island? I know they've technically been 'destroyed', but I haven't been able to find any of the old references to there location. The Clusters and Islands of Terror are located in random locations in the Near Ethereal. There's no real relative location between them and the Core (i.e. it's not like the Amber Wastes Cluster is "east" of the Core or anything). The Domain of Morgoroth and The Circle?? I did not see it on the second map. I always felt that the modual A Light in the Belfry was one of the more fun ways to bring a player into the Mists. I still have that boxed set with the maps and the CD with all the sounds!!! Avonleigh is part of the Shadowlands Cluster (along with Nidala and Shadowborn Manor), thus it is not part of the Core. 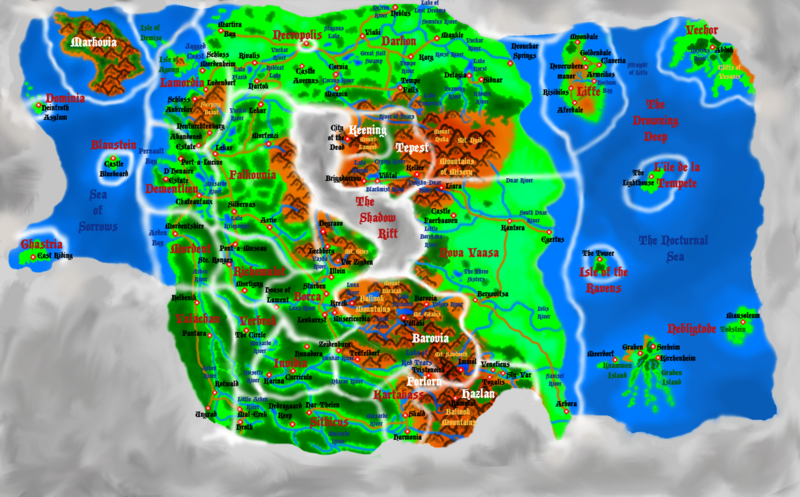 I was going through the Gazeteer on Borca and realized there were all sorts of little geographical details I forgot about because they're not on the map, so I made a detailed Borcan map. It's a combination of the Jester map and the Gazeteer map. 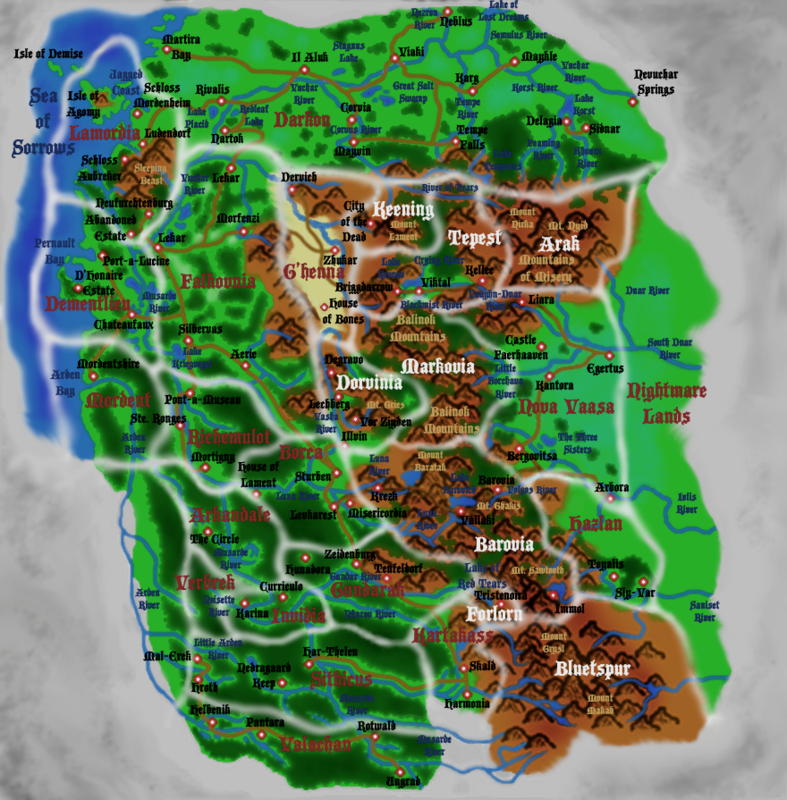 The majority of the changes from the Jester map are because S describes Borca differently than how Jester depicts it. I'm not quite sure what to do with the Lech road, but it's listed so I drew a road heading up in the direction it says it should be going. 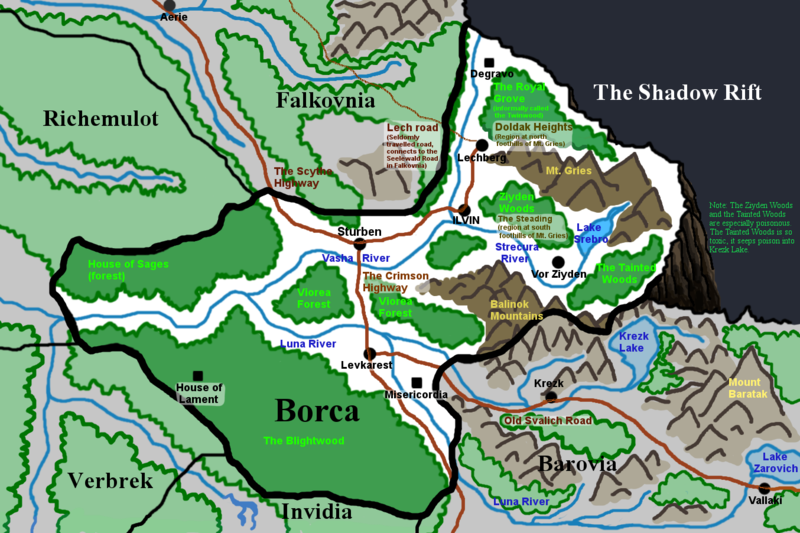 I also added in some Barovian details to give Borca some context in terms of where we generally play in the server. I still have the base file and can edit it if there are any major changes that should be made. No one cares about Borca. Tis a silly place. Reckon we need a compilation of decent maps of domains stickied someplace. I like it, though he does not give the names to the geographical features, it is still cool though. Here is the web of illusion map for reference btw, it does have the name of the geographical features. 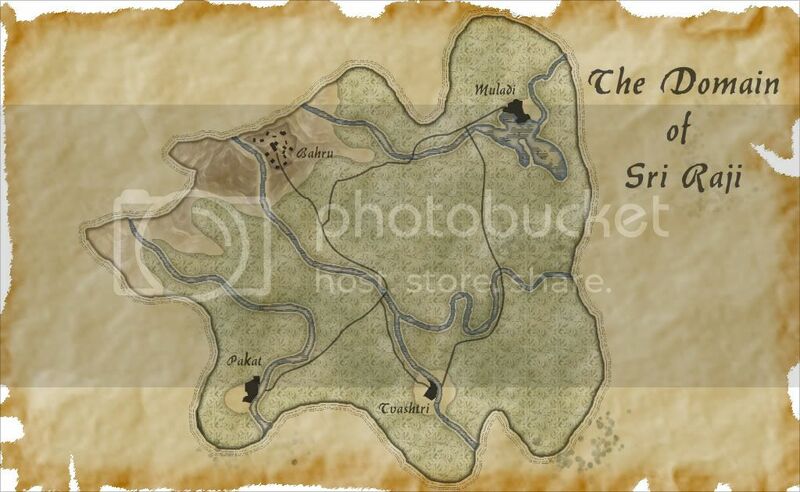 Just so you all know, Jester has redone his maps and has his own subcategory on the FoS website. He has even done a map of the Shadow Rift, Souragne and Verdous lands cluster. Made another map of Port-a-Lucine and its surrounding areas a while ago. Thought I'd share. It's a melding together of the actual server map, and cannon maps, but orientated in the proper IC North/South directions. Some adjustments made to fit in certain areas. Spoiler shows the full size map! It's quite large. Nice, but the port is at the south of the bay. Yeah, most of the stuff is rotated 90 degrees. It may sound counterintuitive but Port-à-Lucine faces north in a bay that faces west (it's at the southern end of that bay, while the university sprawls along its eastern edge). It gives the impression in-game that somehow the sea is north but that's really only because our only coastal areas happen to be around two bays. Yeah, it’s a bit confusing. What I literally did was take the module map that you posted EO, and traced my map over it, trying to fill in some blanks with the big Ravenloft Core map. I guess I need to shift my compass a bit! That map has a lot of issues with city placement. It has the Village of Barovia in the wrong spot as well. Would you be amenable to correcting the facing on the compass of this map, so North points to the left? 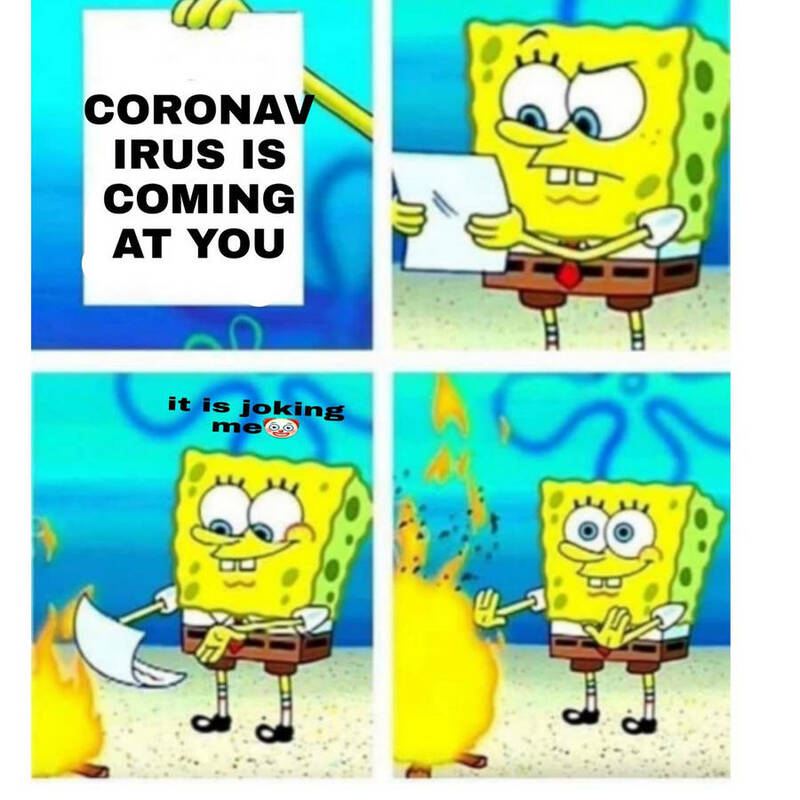 I turned the compass left!